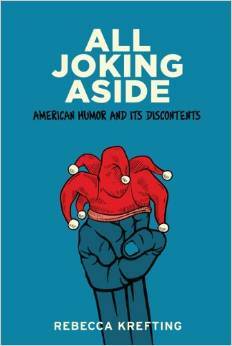 TW) Was there resistance from others in your field or department to the study of humor as a “non-serious” subject? RK: I’m happy to say that this has been a non-issue for me in the departments in which I’ve been trained. Currently, as an assistant professor in the American Studies Department at Skidmore College, I have been immensely fortunate to find a department that encourages my research foci and a welcoming environment from others in the college at large. Skidmore College is home to the long-standing annual National College Comedy Festival, so I also get to teach, mentor, and debate with students who are comedyphiles just like me. Both the Women’s Studies Department at Ohio State University and the Department of American Studies at UMCP had and still have faculty whose areas of expertise were somehow connected to the field of humor studies. I didn’t have to waste time legitimizing my research interests, which was wonderful. I have to say I find that when stepping out of these microcosms, say at national association meetings, that there has been some resistance, though I have yet to be heckled while delivering a paper. The great irony is, of course, when someone doesn’t take humor studies seriously—and this does still happen. So, I’ll make a polite plea here: If you come and hear me present at a conference on stand-up comedy, please don’t use the discussion time allotted to tell me about all your favorite comics. I want my analysis to tease you, to flop around in your noodle and spark debate and discussion, but, in my experience, presenting on comedy often devolves into a “Do you know so-and-so?” contest. Additionally, and to be fair this could be a me-issue, it is pretty embarrassing to be trained in American Studies and be teaching in an American Studies Department and yet I have never been accepted to present at the American Studies Association annual meeting. After being rejected twelve times, I’ve thrown in the towel and attend other conferences instead. I’m not saying I don’t want to swap names and favorite bits (just not in that moment) nor am I arguing that humor studies are more important than anything else, just that humor is an important subject of inquiry that we should take seriously…after we laugh, of course. TW) You worked as a comic and in improv both before and after going into academia. How did that/has that affected your take on the academic study of humor and/or your approach in teaching humor in the classroom? RK: As a performer and a scholar it’s impossible not to consider all angles, which I think becomes advantageous when producing my own scholarship. At one point, I remember reading an article critiquing a comic and a question bloomed large: What would the comic have to say about that? The more I read, the more I saw a notable absence in scholarship attending to what the comic intends to do or accomplish and lots of close-readings for resistance and subversion in comedy. This, I have always met with some skepticism: how can you argue that the sub-text of the joke is resisting dominant culture or social norms while never consulting the author/performer of the joke. This is recuperative work done ad nauseum and some folks’ humor doesn’t need to be recuperated as feminist or agentic or anti-racist. Plus, this kind of analysis comes down to one person analyzing and interpreting the jokes—it’s the smallest sample size ever. Audience reception is an important sub-field in many disciplines in the performing arts, but I’m more interested in how larger groups and communities are analyzing and interpreting the joke and what the joke-teller aims to achieve with that joke. In doing so, the emphasis lies on author intentionality and popular shared reception rather than on narrow interpretations conducted sans important cultural context. As a result, in the classroom, I encourage students to approach any subject of inquiry with what Douglas Kellner calls a “multiperspectival approach” that emphasizes examining the production of any text as well as the society/economy in which it was created, offering a close-reading of the text itself, and attending to audience reception both scholarly and popular. Not surprisingly, I use humor in the classroom—formally, as in introducing comedic texts to watch, read, and analyze, and informally, as in using humor as I lecture or lead discussion. Most of this informal use of humor is improvised and feels more like me being me. I do intentionally have funny rules or practices like making a class rehearse how to welcome a guest speaker, or having certain phrases that I teach them. For example, when I say: “Bring it home,” I want them to hear the phrase and instantly respond; after our drills on the first day of class, when I say it in the future, heads snap forward and eyes are locked with my own. We practice this and it seems silly to them, which is certainly in keeping with my personality. But, there’s a lot going on here. I’m conditioning them to respond in a certain way without being dictatorial; in emphasizing my desires to maximize their learning experience, I’m conveying deep enthusiasm for knowledge acquisition, my love of teaching, and the necessity of their active participation in this process; and lastly, I’m allowing that learning can be fun—a tall order when you’re bandying around words like multiperspectival approach. TW) What trends do you see (or wish you saw) in the development of humor studies? What do you hope for the future of the field? RK: I don’t know that I’m in a position to make any assertions about trends (and if I say more on methodological shortcomings, I feel like I’d be beating a dead horse—which is cruel, obviously and it gives the false impression that I see this as a rampant issue) except I have noticed that more has been published in the past three years on women’s humor than was published in the entirety of the twenty years before that. This comes on the heels of a very visible public discussion and debate on women’s roles and functions in humor production (pace: Christopher Hitchens, Vanity Fair, 2007—look it up if you don’t know what I’m talking about). I believe some of us wrote in response to this and some of us were simply reminded of the scant scholarship available with which to offer refutations to Hitchens’ scurrilous remarks. More of an observation, than a hope, I think we cannot take lightly the impact of new media and emergent technologies on the production, circulation, and consumption of humor. This past year, I have turned my attentions to examining the impact of social media on the economy of humor. Numerous interviews and research of popular discourses demonstrates that the substance of comedy has not changed (sorry Twitter fans, jokes are not all quipped in 140 characters) but the industry is most definitely shifting. Late-night television talk shows are no longer the primary vehicle by which one can establish a following or get that sitcom. There are other ways of being noticed and other end goals other than getting that sitcom. I’m hoping this fragmenting of the market and ability to use social media for promotional purposes will offer moxie-filled charged comics motivation necessary to put their work out there. Of course, this humor will still need to find a good home—minds willing to be entertained by comedy that reminds us that we are not all equal. TW) Your book, All Joking Aside, is focused on the concept of “charged humor” as a specific type of humorous production. Can you give a short explanation of the concept and how it developed? Douglas Kellner, ““Cultural Studies, Multiculturalism, and Media Culture,” Gender, Race, and Class in Media: A Critical Reader, edited by Gail Dines and Jean M. Humez, 7-18 (Thousand Oaks, CA: SAGE Publications, Inc., 2011).